Introducing Daylong, the online retail arm of Credenhill. Daylong is well renowned for high quality compression hosiery. The company has over 50 years of experience, meaning they have the knowledge, expertise and understanding of the market. Giving customers complete confidence and satisfaction with their order. What type of products do Daylong sell? Historically compression hosiery was difficult to buy for the vast majority of the public, Daylong has overcome this by offering an online shop with a wide variety of choice. 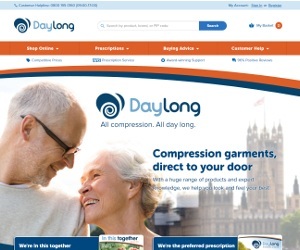 Daylong is the leading company for compression hosiery and it is through their links to the medical community that has solidified this competitive advantage. Along with competitive prices, award winning support, free prescription deliveries and a large amount of existing customers providing positive reviews. Which popular brands do Daylong sell?